Thai Supermarkets – specifically Tops, where I shop as it’s nearest to my house – have a pretty good selection of wines – at least 50 / 60 different bottles to choose from – but tell you very little about them. Despite wine being a growing niche market in Thailand, there’s no one doing clever marketing here to help customers, like Hugh McLeod with Stormhoek. So really it’s a tradeoff between price and simply deciding if the label’s nice or not and then taking a gamble based on that, as there’s nothing else to go on. Besides checking the back to see if it mentions anything about soft and blackcurrant. I’m all about the soft and blackcurrant – anything that’s very quaffable. Therefore, when I get a recommendation for a wine I can buy here, it’s extremely useful. At the recent Thai wedding of Mint and Greg, Greg’s dad Tony knowledgably advised me to try the domestic Thailand wine brand Monsoon Valley. 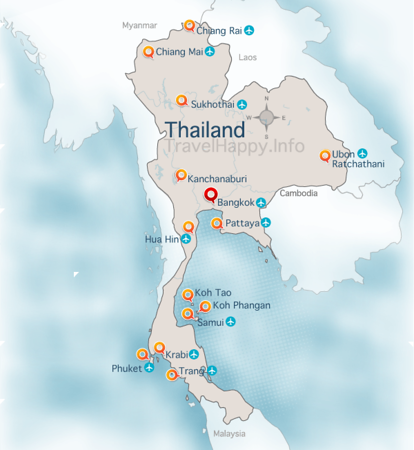 Normally I wouldn’t look twice at a Thai Wine – it’s cheaper than most other wines, certainly, but given wine is not part of Thai culture at all, I had the usual prejudice that it would be rough as guts. 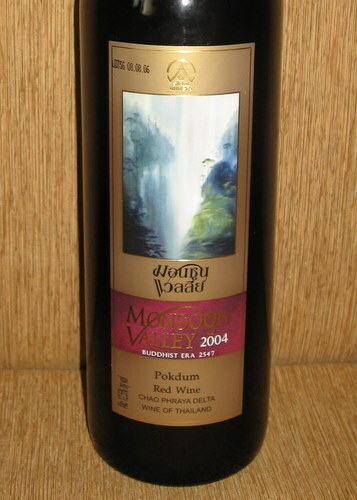 Turns out the red Monsoon Valley Pokdum 2004 is a cracking wine. Soft, easily drinkable, and none of the sourness that comes with cheaper wines. A top result that my girlfriend and I both agree on. Finally we have a drinkable wine we can buy regularly! The bonus is that it’s usually around 400 Baht too, so its not outrageously expensive. Monsoon Valley grow their wine on “floating vineyards” in the Chao Praya river, so already a few friends and I are contemplating a visit. 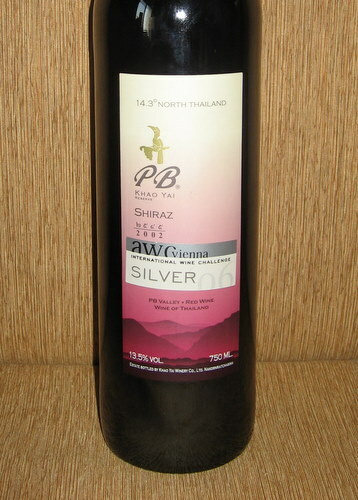 We also tried another Thai brand, PB Valley’s Khao Yai 2002 Shiraz , which is apparently a Silver Medal winner from AVC Vienna – not that I have any idea what AVC Vienna is, but sure enough, the medal thing convinced me to try the wine. This was also pretty good, but more than a glass feels a bit much. It’s got a real flowery smell to it that makes it feel a bit sickly once you get halfway down the bottle. (No, we weren’t necking it). It’s worth a try, but I couldn’t drink it regularly. Therefore, if you’re on holiday in Thailand, I’d definitely recommend you give Monsoon Valley a go if you’re fond of wine. It’s apparently also available in the USA and UK, as they needed to establish it in those markets to make it viable to sell it here. Let me know if you find it wherever you live.